Lillian M. Miller Carroll, died Monday, March 24, 2014, at Columbus, Ohio. Born November 28, 1917, to Herman N. and Elizabeth (Schetter) Miller in Toledo, Ohio. Earned a bachelor’s degree from DeSales College, Toledo, OH; BS in Library Science from Western Reserve (now Case Western) University, Cleveland, OH. Served as librarian in Toledo Public Library, then as head librarian in the Sylvania (OH) Library. Detoured to own and operate Miller Flowers with her brother, Norman, who predeceased her. Married M.W. (Bill) Carroll in 1953. Villas at St. Therese Assisted Living in 2005, where she volunteered to organize and operate its library. She also tended plants and flowers. Several of her short stories won ribbons in the annual contest sponsored by AOPHA. Following a 2012 stroke, she was lovingly cared for by Sisters and staff of Mother Angeline McCrory Manor. She is survived by twin daughters, Mary Anne Terry, Kalamazoo, MI, Julie A. Carroll Darling (Stanton G., II), Worthington, OH; two sons, W. Kipp (Danette), Anacortes, WA, Patrick E. (Susan), Chesapeake, VA; twin grandsons, Frank V. Cirivello III, Columbus, OH and Vincent F. (Leah) Cirivello Jr., Gahanna, OH; sister-in-law, Nancy Miller, Maumee, OH; many nieces, nephews and cousins. She was also predeceased by sister, Kathryn M. Keller. Friends may call at the Reeb Funeral Home, 5712 N. Main St., Sylvania, Ohio, Thursday, March 27, 2014, 3:00 p.m. – 8:00 p.m. The Funeral Mass will be conducted at St. Patrick of Heatherdowns, 4201 Heatherdowns Blvd., Toledo, Ohio 43614, Friday, March 28, 2014, at 1:00 p.m. Interment to follow at Calvary Cemetery, 2224 Dorr Street, Toledo, Ohio. A Memorial Mass to be held at Mother Angeline McCrory Manor later. Longtime Greenport resident Mary Patricia Cecilia McHugh Mazzaferro died March 17 at her home. She was 63. Ms. Mazzaferro was born Jan. 10, 1951, in Toledo, Ohio to Maryanna (Pfeiffer) and Thomas P. McHugh. She was the fifth generation of her family to attend Immaculate Conception Grade School in Toledo and graduated in 1969 from McAuley High School, also in Toledo. On Nov. 20, 1970, she and Gene Mazzaferro eloped in Erie, Michigan, reconfirming their vows July 16, 1971, at Holy Rosary Cathedral in Toledo. Ms. Mazzaferro was employed by Eastern Long Island Hospital in Greenport, working in numerous departments over 16 years. Family members said Ms. Mazzaferro’s greatest joys were spending time with her loving husband, children, and grandchildren, Zander and Aria, as well as with other family and friends. She also loved traveling, reading, trying out new recipes and watching movies. In addition to her husband, Ms. Mazzaferro is survived by her son, Gene; her daughter, Mandy; her two grandchildren; her sisters, Georgianne Hobson and Kay McHugh and numbers cousins, nieces, nephews, in-laws, family and friends. The family will receive visitors Thursday, March 20, from 2 to 4 and 7 to 9 p.m. at Horton-Mathie Funeral Home in Greenport. A funeral service will take place Friday, March 21, at 10 a.m. at St. Agnes R.C. Church in Greenport. Burial will be private. Memorial donations may be made to East End Disabled Benevlolent Fund, Inc. 185 Mechanic St. E, Southold, NY 11971. 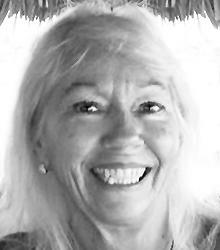 Janet Sue Kazmierczak, age 59, of Bradenton, Florida, passed away at her home on Tuesday, March 11, 2014. She was born in Toledo, Ohio on April 22, 1954, to Leo and Patricia (Labadie) Kazmierczak. Janet was a 1972 graduate of McAuley High School in Toledo. She worked for the Toledo Police Department for several years before moving to Fort Lauderdale, where she joined the Pompano Beach Police Department as an officer. Janet later joined the Broward County Sheriff’s Department and worked in security for the Fort Lauderdale Airport. Her security experience led her to move to the U.S. Virgin Islands, where she became a security officer for the Ritz-Carleton in St. Thomas. Upon her retirement in 2012, she moved to Bradenton, Florida. Janet is survived by her father, Leo T. Kazmierczak; sisters, Julie Newby and Karen Krzyminski; brothers, Rick, Dave and Bob; aunt, Sr. Mary Maurus Labadie, SND; nieces, Sarah Sutter, Jenny Greif, Erin Heckler and Jodi Krzyminski, and nephews, Nathan, Kyle and Michael Kazmierczak. Daniel K. Rodgers, age 84, of Maumee, Ohio passed away on Friday, March 7, 2014, at Kingston Rehabilitation surrounded by his family. He was born on March 24, 1929, in Toledo, Ohio to James and Catherine (O’Neil) Rodgers. Dan started Dan Rodgers Sporting Goods in 1970, and loved his job, but his greatest joy was his family. He enjoyed working out and playing golf, handball and tennis. Vacations were special times for the whole family. Dan liked to fish and spend an afternoon captaining his pontoon boat on the Maumee River. He had a passion for life, never lost his sense of humor and saw each day as a new adventure. He is survived by his wife, Susan (McAuley); daughter, Ann Hauden; daughter, Joanie Baas; daughter, Cate (Terry) Kaczala; son, Danny Rodgers; daughter, Sarah (Jason Thomas) Ward; son, Micheal (Katie) Rodgers; grandchildren, Jerry, Jimmy, Kelly, Meghan, Maddy, Adam, Deanna, Callie, Sarah, Laney, Aiden, Brady, Alivia, Michael, Daniel and baby Rodgers, and great-grandson, Layden. He was preceded in death by his parents; brothers, Chester and James Rodgers and granddaughter, Reilly Rodgers-Ward. Friends and family will be received at the Maison-Dardenne-Walker Funeral Home, 501 Conant Street, Maumee, Ohio on Monday, March 10, 2014, from 2:00 p.m. until 8:00 p.m. with a prayer service at 7:30 p.m. A Funeral Mass will be celebrated on Tuesday, March 11, 2014, at 1:00 p.m. at the Historic Church of St. Patrick, 130 Avondale Avenue, Toledo, Ohio. Rose M. Zbierajewski, age 79, passed away on Tuesday, March 4, 2014. Rose was born in Toledo on August 28, 1934, the daughter of Raymond and Harriett (Szczepanski) Thiel. She worked in administration at the Toledo Zoo for 20 years and in her younger years had worked for Willys Overland. Rose was an avid reader and loved to travel. She cherished spending time with her grandchildren, traveling with them and babysitting for many family members and friends. Rose was preceded in death by her parents; brother and sister-in-law, Norbert and Nancy Thiel and brother, Thomas Thiel. She is survived by her loving husband of 59 years, Donald “”Paul”” Zbierajewski; children, Marcia (Chuck) Martin, Donald (Judy) and David (Julie) Zbierajewski and Amy Campbell; grandchildren, Samantha (Tom) Eischeid, Jaime Zbierajewski, Chuck Martin, Matt Zbierajewski, Kristin Zbierajewski, Courtney Campbell, Paul Martin, Rachel Zbierajewski; great-granddaughter, Leah Eischeid; sister-in-law, Gert Thiel; numerous nieces and nephews. Family and friends may visit Friday, March 7, 2014, from 2:00-8:00 p.m. at the W. K. Sujkowski & Son Funeral Home, 3838 Airport Hwy. where Vigil services will be held at 7:00 p.m. Funeral Services will begin with prayers in the Mortuary Saturday at 9:30 a.m. followed by Mass of Christian Burial at 10:00 a.m. in St. Charles Borromeo Catholic Church. Interment will follow at Resurrection Cemetery. The family prefers tributes be made to St. Patrick of Heatherdowns Parish or a charity of the donor’s choice . Josephine A. Bauer, 84 years, of Toledo, Ohio passed away peacefully on March 2, 2014, in St Luke’s Hospital. Josephine was born in Toledo, Ohio on August 18, 1929, to Alonzo and Mary Goulet. She graduated from St. Ursula Academy and attended the former Mary Manse College and on May 24, 1952, she married James T. Bauer. This May, they would have celebrated 62 years of marriage. Josephine worked for the Art Iron Company as a cost accountant retiring in 1991. She was a member of St. Patrick’s of Heatherdowns Church, where she was the past president of the Altar and Rosary Society and was the director of their Social and Recreational Faith Community. Josephine was also a member of the Art Iron Retirees Group. She loved to arrange flowers, camping, sewing, cooking and a good margarita; but most of all she loved her grandchildren. Josephine was preceded in death by her parents and her sister, Loretta Bouya. She is survived by her husband, James; her children, Daniel (Christine) Bauer, Ruth (Rickie) LaPoint, Thomas (Loretta) Bauer, Jean (Alan) DeMania, Lawrence (Nancy) Bauer and Anne (Joseph) Feck; 20 grandchildren and 14 great-grandchildren. Friends may visit at the Coyle Funeral Home, 1770 S Reynolds Rd., on Friday, March 7, 2014, from 2:00-8:00 p.m., where a Vigil will be held at 7:00 p.m. Funeral services will begin in the mortuary on Saturday, March 8, 2014, at 9:30 a.m. followed by the funeral Mass at St. Patrick of Heatherdowns Church at 10:00 a.m. Interment will follow in Resurrection Cemetery.